Bodybuilders like Bill Pearl and Casey Viator exemplified outstanding forearms in the 1950s and 1960s. In the 1970s, Sergio Olivia was king of the forearms. The 1980s saw thick, insane forearms on men like Bertil Fox. In the 1990s, Steve Brisbois had perhaps the best ‘hamhocks’ in the business. And today, top pro Phil Heath is known for his almost cartoon-like forearms. First off, it should be noted that some bodybuilder never train their forearms. Their forearms receive secondary stimulation from gripping the barbell, on exercises such as deadlifts and barbell rows. They also become highly involved in arms exercises such as barbell and dumbbell curls, and on triceps movements, to a lesser extent. Seeing as they are professional bodybuilders with a wealth of contributing factors (proper nutrition, amazing genetics, and superior steroid stacks), the combination of these factors plus the secondary effects of the aforementioned compound exercises leads to adequate stimulation of the forearms. For those “Joe Six Pack” trainers, which includes most of us, some direct forearms training is required in order to keep them on par with the rest of our physiques, and to prevent them from becoming a limitation in strength training. 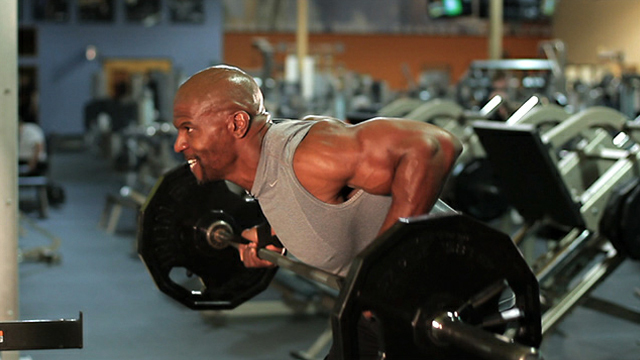 Alternate dumbbell hammer curls are the first exercise which should be completed each week. Three to five sets following the completion of biceps training is a terrific transitional movement group. The biceps should be torched by this point. Now, finish off training with barbell wrist curls. Standing in a squat rack, on a flat bench, or just in an empty area, complete the wrist curls in a slow and deliberate motion. You should never rush forearm training, nor should you ever train with excessive weight. The goal of forearm training is never to move the most weight, or to do it in the fastest manner. Instead, the goal is to flush the forearm region with as much blood as possible. This leads to muscle growth, and increased grip strength. It should be noted that some bodybuilders intentionally avoid all forearm training – and often work to avoid massive stimulation of the area – in order to keep their forearms smaller. It may sound odd that any bodybuilder would want to keep a body part underdeveloped. But the thinking involved points to the fact that bodybuilding is all about illusions. The smaller the forearms look, the larger the upper arms look by comparison. Therefore any chance they have, they skip forearm stimulation. This kind of training methodology goes against traditional thinking, and certainly lends to potential future weaknesses in training using compound movements. For many bodybuilders (who make their living from the sport) with weak upper arms, however, it is a trade-off they are willing to make. Whatever your goals, and wherever you are on the bodybuilding food chain, always work to make concentrated forearm training a standard staple in your weekly training protocol. You’ll be glad you did. The overall increase in grip strength, along with the improved look of thicker lower arms, will lead to more overall bodybuilding success. This entry was posted in Training and tagged Arm Training, Barbell Rows, Biceps Training, Bodybuilding, Forearm Training, Forearm Training Tips, Training Tips, Triceps Workout. Bookmark the permalink.